Over the past few months, there has been a noticeable increase in the use of loyalty programs by restaurants. Popular restaurant chains have been turning to these programs to acquire specific customer data and create more targeted promotions. They have also been experimenting with mobile technology and social media platforms as additional channels for gaining long-term customer loyalty. DMNNews.com reported on how the restaurant industry is leveraging the appeal and advantages of loyalty programs. “The exciting aspect of loyalty is it’s always evolving as you learn about your guests and become more knowledgeable about their dining frequency, their preferences and how they interact with your brand,” said Dana Benfield, director of loyalty and retention at Red Robin. Since February, the family dining chain has been enhancing and expanding its Red Royalty program launched last year. The majority of the program’s communications are sent via email yet the company is exploring increasing its mobile and social reach in the future. There have also been some innovative apps and programs introduced that allow both franchise and independent restaurants to collect customer data and promote loyalty. These include turn-key loyalty programs, such as Spoonify and Belly, which provide restaurants with more advanced promotional possibilities. Another new program called Riiwards features a self-service platform with a variety of rewards and analytical tools for measuring member demographics and behavior. One app that takes a charitable approach to loyalty is the Eat A Bite, Give A Bit program. This smartphone app uses the incentives of customer rewards and hunger-relief meal donations to encourage consumers to visit participating restaurants. T.G.I. 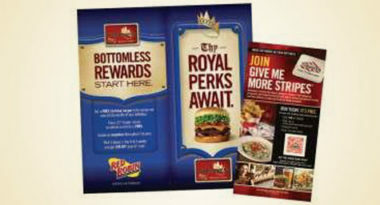 Friday’s has enhanced its rewards program by leveraging research on customer engagement and company feedback. Members of the chain’s Give Me More Stripes loyalty program are now able to earn and use reward points beyond the previous 30-day expiration period, as well as choose from a variety of rewards and have the opportunity to get preferential seating on popular weekend evenings. The franchise is also keeping a database on member visits and orders. In addition, the company is also incorporating more mobile messaging into its customer communications. The restaurant industry’s stronger emphasis on rewards programs appears to be paying off. According to the National Restaurant Association’s 2012 Restaurant Industry Forecast, 30 percent of all restaurateurs and 69 percent of fine-dining operators currently offer customer loyalty programs. In addition, 57 percent of adults admitted they are more inclined to visit restaurant with loyalty programs than those without. It looks like restaurant loyalty programs are already accruing a loyal following. At MDG, our 360° marketing approach uses just the right mix of traditional and online media to reach your hospitality marketing goals. While some industries may fare better on TV and others online, we strive to create a balanced approach where digital and traditional marketing efforts support each other and your message is tailored to the medium. To learn more about loyalty programs and the latest trends in restaurant marketing, contact MDG Advertising today at 561-338-7797 or visit mdgadvertising.com.